Four days after the closure of the border in Röszke, the Hungarian government found itself on the defensive again. From Friday the 19th of September, thousands of refugees and migrants were transported in trains or buses from Tovarnik or Opatovac towards the non-secured sections of the Hungarian border. In the following four weeks – against all rules and regulations and bashfully concealed by Orbán – a migratory route opened across the green border. During these four weeks, three to four Hungarian special trains transported the refugees and migrants without further registration to the Austrian border in Hegyeshalom, at the crossing to Nickelsdorf. At the same time, the Hungarian government began to hastily construct another fence at the sensitive sections of the Croatian-Hungarian border. In the end, just as during the previous month in Röszke, 4.000 refugees per day squeezed through the remaining small hole. More than 200.000 people were brought to Hungary between the closure of the Röszke border and the closure of the hole in the fence. The UNHCR infographic demonstrates that the vast majority of migrants passed via Serbia and Croatia through the green border to Hungary, while the passages through Slovenia remained in the low double-digits until 17th October 2015. It remains unknown how and through which channels the tacit agreement between Croatia, Hungary, Austria and Germany was reached during the hectic days between September 14 and September 18. The skills of the Austrian diplomacy, with their sensitivity for the instabilities and animosities between the states of the former Yugoslavia, can be assumed to have played an important role. All actors involved were aware that any bottlenecks on the route could lead to riots and unpleasant images in the world press, of which more than enough were already circulating. The state authorities – police and soldiers in riot gear – who were not able to stop the people on the move, alternatively made use of their martial threat potential to at least make them line up in rows of two. The breakthrough in Gevgelija on 22 August, the March of Hope on 4 September, the militancy in Röszke and the breakthrough in Tovarnik on the following day were not the only important features marking the strength of this movement and the creation of the temporary possibility of quasi free passage. The successive numbers of migrants, who came to Greece via the Aegean – more than 7.000 per day in October and in November more than 6000 – simultaneously carried particular significance. In the meantime, Greece had established a regular ferry connection from Lesvos and the other arrival islands in the Aegean to the port of Piraeus, and was deploying buses for the quick onward transport of the migrants from Piraeus to Idomeni. In Gevgelija, on the other side of the Greek-Macedonian border, around four or five trains per day were going across Macedonia to the Serbian border. The journey took three hours for 180km and was then followed by another 8km across the border to Presevo. There, chains of buses were accumulating for the northward transport to Sid. Once there, another 2km by foot through mud and corn fields awaited the people in order to cross the border to Croatia. In Croatia, they were received by Croatian police and escorted to the buses to Opatovac. It was a surreal situation and probably nothing could express more the power of the ongoing refugee movement and the fear of governments of these struggles: more than 1600 refugees were transported last Saturday night at 10 p.m. to the little train station of Botovo. It lies outside the small village of Croatia and is very close to the Hungarian border. A lot of policemen, volunteer fire fighters, red cross personnel and about 150 activists from the open border caravan were expecting them. Hundreds of young people mainly from Syria and Afghanistan, but also many families with hundreds of children, very old people, even handicapped persons with wheelchairs left the extratrain, which was ordered by the Croatian government. Most of the refugees were held in a Croatian camp before, in Opatovac near the Serbian border, after having arrived by boat on the Greek islands and having gone through northern Greece, Macedonia and Serbia. Now they were facing a very strange border crossing. First they met local supporters and activists from the open border caravan and they were offered drinks, food and clothes (and information such as the w2eu-visitor cards) on the street, which looked like a night bazar. Then, escorted by the Croatian police, these 1650 refugees were led through a small dark forest to the green border of Hungary. Barbed wire was everywhere at the borderline, but the armed hungarian soldiers opened a small path through this fence and the refugees were asked to cross it with not more than two persons beside each other. Finally the hungarian soldiers escorted them through a field to another train, which was waiting nearby with 20 wagons. From a small group of hungarian supporters the refugees received some more food through the windows. Nobody could imagine, that bureaucratic states can become so creative and even organize transport through their green borders to avoid the struggle of refugees. They obviously learned from two earlier experiences: first in Macedonia at the border to Greece the military had to withdraw their forces after the refugees did not stop their protests and stormed the provisional fences. A huge media attention was given and the pictures were in all news, when soldiers have beaten refugee families with their children. Hardly to imagine, that the governments in Austria and Germany did not know about the stately organised border-smuggling between Croatia and Hungary. And this means, that the whole european borderregime appears now more helpless and chaotic as ever before. When will Budapest shut the borders? The Balkan route no longer dominates the headlines, but only because Hungary has temporarily given up on trying to stop the movement of migrants. With the closure of the border to Serbia and the coming into force of massively tightened border regulations in mid September, the number of entries plummeted, but only for a few days. Now, the refugees travel via Croatia, where the authorities transport them immediately to the Hungarian border. Since the emergence of this new route, Hungary started to construct another fence. According to the Hungarian chancellery minister Janos Lazar, the fence is 99% finished. Provisionally, the entry of asylum seekers is tolerated, and lately around 6000 persons entered per day. They are transported to the border with Austria. However, the coming to an end of this routine is just a question of time. In the domain of interior policy, it is difficult for Orban’s government to explain why considerable effort is being invested into securing the borders against allegedly dangerous people fleeing due to economic reasons, while nevertheless allowing thousands to pass. Orban’s argument that Budapest is the only country complying with EU regulations is equally insubstantial. Currently, Hungary is waving through refugees in contradiction to the Dublin Regulation just as Greece and Austria. During the visit of Croatian president Kolinda Grabar-Kitarovic this week, it was unofficially stated that the current regime will be maintained for the time being, possibly until the elections in Croatia in early November. The precondition is, however, that Germany does not change its generous admission policy. However, the last hole in the fence along the Hungarian-Croatian border was already closed in the night to Saturday 17th October. Certainly not accidentally, Germany simultaneously closed the border to Austria – only for a few hours, but nevertheless issuing a clear warning to the states along the new corridor, to Croatia, to Slovenia and also to Austria, that the passage without registration would not be tolerated permanently. Croatia reacted immediately and left thousands of migrants stranded in the undefined territory between Serbia and Croatia. Another thousand were blocked in Opatovac. Vienna / Graz / Salzburg / Ljubljana – This weekend, the Hotspot for refugee arrivals to Austria has shifted from the Hungarian-Austrian to the Slovenian-Austrian border. After Hungary ultimately closed the border to Croatia at midnight, the people seeking protection had to travel via Slovenia to Austria, as most of them still want to reach Germany or Northern Europe. Approximately 2600 people had entered Austrian territory in Bad Radkersburg and Spielfeld during the course of the weekend until Sunday 4pm. Oberst Klaus Jäger, head of central transport management in the federal refugee crisis committee told the Standard that the numbers were low because Slovenia only allows 2400 people per day to enter from Croatia, and also registered them. A notification from the Slovenian interior ministry, which alleged that Austria had requested Slovenia to only allow 1500 refugees per day to transit, was denied by the Austrian interior ministry. While 4155 persons arrived in Nickelsdorf on Saturday, now there is „zero rush“ at this border crossing. In Austria itself, around 200 people made an asylum application on Saturday. Those crossing the border from Slovenia are brought to Graz Ostbahnhof station; the central station of Graz is not approached. According to Jäger, the refugees can continue in regular trains from Graz – but not into the city of Salzburg, where the emergency shelters are overcrowded. Instead, the people are being brought to transit camps in Northern Austria close to the border with Germany. Most of them stay here for a night, until continuing towards Germany, usually on foot. On Saturday, the atmosphere was tense. According to Jäger, an „alarm notification“ was disseminated in the federal crisis committee, stating that Germany had closed all border crossings except those at Freilassing for pedestrians, but the notice was withdrawn two hours later. According to Jäger, the German authorities attempt to channel the migratory movements with this method – although they know that barring the official crossing points result in a higher number of crossings via the green border, which is equally undesired. Jäger: „Because then Germany would have to deal with an unpredictably high number of new asylum applications, which could strain the capacities“. Meanwhile, the German police union argued for the construction of a fence at the border with Austria. Moreover, the opposition of the CDU fraction to the refugee and migration policy of German chancellor Angela Merkel is increasing. As the Bild newspaper reported in its Monday edition, a group around the chair of the CDU parliamentary circle for the middle class, Christian von Stetten, wants to force Merkel to end her policy of open borders by preparing a motion for the closure of the borders. Slovenia had successfully kept the route of migratory movements away from its territory in the days after the border closure in Röszke. In Harmica, the border crossing with Croatia, the Slovenian police used tear gas, also against women and children when migrants and activists demonstrated for the Right to Move collectively. Moreover, a train with migrants and refugees on board was stopped shortly after the border. Before Slovenia became the new transit country four weeks later, the notorious stages of defence, chaos and eventual adjustment repeated themselves. One of the few constant factors in the „Fall of Migration“: when the Balkan route moved to a new state, governments initially reacted with panic. And it always took a few days until they realised that the solution of the ‚problem‘ could not be the iron hand of the state, but the efficient organisation of transit. The situation that had caused intolerable conditions after September 14 repeated itself in the days following October 19 in Slovenia. The first step was the declaration of an emergency situation, in order to be able to deploy military units at the border. The interior ministers of Slovenia and Croatia had already announced that they would organise the ‚corridor‘ together before the border was closed; nevertheless Slovenia limited the number of permitted transits per day to 2500 – which had the consequence of provoking an accumulation of people in Croatia and Serbia. The train connections between Croatia and Slovenia were suspended for one day. At the same time, as rain continuously poured down and the winter cold started, thousands of people got literally stuck in the mud, whilst 5000 new people coming from Macedonia arrived every day. Thousands of refugees, among them many women and children, are camping in the cold and rain at the Croatian-Slovenian border. They try to protect themselves from the constant rain with blankets and tarpaulin and light small fires to keep warm. The Slovenian police is blocking the border and violently preventing the people from continuing to Austria and Germany. The police in Ljubljana stated as a justification that Slovenia’s reception capacities are exhausted. More and more refugees on the so-called Balkanroute are trying to reach Central Europe via Slovenia. According to the Slovenian police, 12.600 people crossed the border to Slovenia in the past 24 hours. The aid organisation Care highlights that the refugees are not prepared for the winter. According to the reports, more than 34.000 people arrived in Slovenia between Saturday and Thursday morning. In addition, thousands of refugees are waiting in Croatia and at the Slovenian border to Austria. The Croatian authorities allow smaller groups of people to pass the Berkasovo/Bapskanur border crossing adjacent to Serbia, because their nearby preliminary reception camp Opatovac is already overcrowded with 3500 people. On 20th and on 21st at Berkasovo-Bapska (SRB-CRO) border crossing once again, people were stronger than the barricades the croatian police put up there. After the night spent in the mud and cold, 2500 people overcame the fence or went around it over the “green border”. People are arriving exhausted from all the difficulties of traveling and they are told that the border is closed. But what does this “the border is closed” mean at all? In the moment when people run over the fields the imaginary line which supposed to be the border simply stopped to exist. The human fence of robocops became ridiculous. After overcoming the barrier (the border line), an even larger problem appears because the organized-fully controlled corridor disables all the possibilities to continue the travel independently. People have to wait again for the organized buses (that sometimes do not exist), or in order to enter the camps, in proper(!) lines, enduring police/military shouting at them, and all the humiliation that comes with illegalization. In the meanwhile, these people should be considered the lucky ones who get the chance to pass through the safer way which the new corridor enables. Generally the so called “humanitarian”corridor for a more human migration towards the EU, or the chosen country of exploitation, controls almost all movement of migrants that can not enter in a legalized way. The governments, together with the big humanitarians (UNHCR, Red Cross and other NGOs) can propagate a humanistic image of a ‘helper’ and at the same time they are responsible for sufferings at the borders (example: EU funds at the same time finance NGOs working on the so called “migrant issue” and the construction and maintenance deportation prisons). Also the intermediate people (volunteers, translators, … ) play an important role, because they are there for concrete help and have certainly good intentions, but therefore are often being put in a position of power which can take away or hinder the power of the migrants in that moment, patronizing them. Just talking about bad conditions but not about the policy which causes them, calling governments on building more proper shelter facilities, but not calling them to remove barricades, withdraw army forces, and to stop every form of violence, is leading to a strange continuity of “migration management”, which includes often cooperation with police in order to have “everything under control”. The situation at the Slovenian border was similar: Migrants were exhausted from the rain, had to line up in formation and were then escorted to the transit camp Brežice in a line led by a police officer on a horse. The Slovenian Opatovac is called Brežice – a hastily constructed camp, set up behind a police station in the village of Dobova belonging to the municipality of Brezice close to the Serbian border. It is made up of tents standing outside in the cold on the hard floor of a parking lot. The refugees are squeezed behind the police barriers and the iron fences around the terrain of a large empty building in the Southern Slovenian municipality Brežice. Bettina Sillinger, an energetic and hands-on young woman studying in Vienna, is passing bread through the fences. Many hands stretch through the grids, everybody wants to have their share. It is an unnerving scene, reminiscent of hard times in the last century. Dignity is not preserved. If they had not brought 1500 sandwiches donated by the Islamic community in Vienna, even more people would have remained hungry. Unrest is spreading among those waiting. „Germany, Germany“, they chant. They do not want to wait any longer, the onward transport to Germany is too slow. Special police units take position, several dozen police officers equipped with shields move towards the barriers, which further increases the volume of the chants. In addition, three vehicles of the Slovenian army are parked in front of the camp, armoured transporters whose big wheels leave deep marks on the soft grass. Now and then helicopters circle above the area. In the afternoon, three vehicles with a total of 60 soldiers arrive. Nevertheless, one cannot speak of this as a large-scale deployment of the army in Slovenia. … The army has secured the station and there are several jeeps, and soldiers smoking cigarettes in the cold. Exhausted migrants are trying to rest. At least they made it until the station, and will be brought to Spielfeld at the Austrian border with the next train. Burning tents, freezing children sleeping outside – and more and more people keep arriving. The control system is collapsing at the Slovenian-Croatian border. The smell of burnt fabric hovers above the fenced tent town. A police helicopter is constantly circulating around the reception camp in Brežice. A camera drone flies above the remaining sticks of the burnt tents. Thousands of refugees are travelling to Austria via Slovenia. The situation at the border in Spielfeld is becoming increasingly chaotic and the transit camps are overcrowded. Many people start the journey towards the North by themselves. Until now, the procedures in Spielfeld follow an orderly fashion; the Slovenian police brings the refugees to the border in groups of around 200 persons, where the Austrian authorities take over. But the situation escalated during the past days: on Tuesday evening, 4000 people who did not accept to continue to wait for their onward journey in Slovenia, arrived in Austria. They pushed against the barriers and climbed over the fences, brief tumultuous scenes unfolded at the food distribution. After the initial agitation, the situation calmed down quickly. Most of the people were able to continue their journey during the night and the last refugees were brought to accommodation centres on Wednesday morning. The Austrian Spielfeld is the new centre of the refugee crisis. Austria capitulated vis-à-vis the refugees arriving from Slovenia and allows them to cross the border. Gripping scenes unfold. „Everybody sit down immediately. Follow our instructions. And no fights.“ This announcement sounds through the no-man’s-land at the border between Slovenia and Austria in Arabic and English. The refugees follow the instructions. They are hungry, thirsty and visibly strained from the struggles. Approximately 1000 people sit down on the cold asphalt. Who does not follow the instructions is not allowed to continue the journey, the announcement threatens. These are the days when the propaganda movie from Aust&Co on N24 was created, which later received a television award and is available on the website of The World. The film criticises Merkel, portraying her as the person to blame for the misery of the migrants, but it was filmed on 28 October and willy-nilly shows some of the migrants in the aforementioned tense situation. EU states and the West Balkan countries want to slow down the flow of refugees on the Balkan Route. „We will discourage refugees from moving to the border of another country in the region“, the declaration states. „A policy of waving through refugees without informing neighbouring countries is unacceptable. Along the Balkans, refugees are to be filtered in so-called Hot Spots. The Balkan states should carry out the dirty work for Angela Merkel. The proposals made by chancellor Angela Merkel and European Commission president Juncker at the Balkan emergency summit in Brussels sound harmless, almost humanitarian. Improved exchange of information, more help for refugees, joint management of the migration flows from Turkey to Germany: who could oppose these proposals? However, an unspoken objective is hidden behind these words: the Balkan is to be turned into a transit zone, where „legitimate“ and „illegitimate“ refugees are registered, selected and deported. What Merkel is not able to implement in Germany, should now be shifted to Croatia, Bulgaria or Greece. Simultaneously with the EU summit in Brussels, activists on the other side called for a demonstration in Spielfeld: for freedom of movement, against border fences! In Spielfeld and everywhere! Thousands of refugees and migrants are currently waiting squeezed between fences at the Slovenian-Austrian border close to the town of Spielfeld and are demanding their right to continue their journey and freedom of movement. Austrian military and police are forcing the people into queues and kettles for registration; many have been waiting the whole night outside in the cold, and all of this after they have already been exposed to enormous strains on the Balkan Route for days. We close this chapter at this point – but not without noting, that the pressure of the migrants did not cease in the course of autumn, and that the plans of the EU summit turned out as foam and false dreams under this incredible and constant pressure. The subsequent chapter will report on Idomeni. What persists are the dreams of the people on the move themselves – a dream, which has been associated with the name Merkel, but which primarily contains a demand for self-determination and happiness. After the Slovenian blockades were overcome, the route became passable again – but soon limited to persons from Syria, Iraq and Afghanistan. Heated tents and provisions, charging stations for mobile phones and free Wifi were provided at almost all places the refugees and migrants had to pass. Trains in Gevgelija were available for 25€ per person, the buses waited in queues in Presevo to bring the migrants to Sid for 35€, then the trains continued free of charge through Croatia until the new registration camp in Slavonski Brod. Even Dobova/Brežice became a functioning transit camp. The migrants only needed 3 to 4 days for the 1.200 kilometres through the Balkan states until Austria – all a result of the chain of struggles and determination described here. How big is the danger that the Balkan states will close their borders? The following assessment by the German security authorities suggests a sequence of events similar to the events in Idomeni after 18 November, when people who are not from Syria, Iraq or Afghanistan were prevented from continuing their journey. There were rumours that not only Morocco and Algeria, but also Afghanistan will be designated as ’safe third countries‘. There were discussions about large camps in Greece. But the authorities in the analytical hubs are well aware that the autonomy of migration cannot be planned and cannot be controlled by decree. An event of the century of the best kind. German security agencies are preparing for the worst scenario. An internal analysis of the situation expects „rushes on the borders“ and „panic and chaos“ in the case of border closures by the Balkan states. Given the increasing numbers of refugees, the German security agencies are preparing for the border closures by Balkan states. This information is contained in the confidential situational analysis on „Illegal Migration“ by the „Joint Analysis and Strategy Centre for Illegal Migration“ (Gasim), to which „Welt am Sonntag“ has gained access. The situational analysis cites a „rush on the borders“ as a scenario. Moreover, it states that a „dead end“ on the Balkan Route without European support could „trigger panic and chaos among migrants and authorities“. The agencies involved with the Gasim in Potsdam include the Federal Intelligence Service, the Federal Criminal Police Office, the Federal Office for the Protection of the Constitution, the Federal Police, the Federal Foreign Office and the Federal Office for Migration and Refugees, among others. The security agencies warned that refugees cross the Balkans to Central Europe in an increasingly short amount of time. The „transit time“ has „reduced further“. But in the case of simultaneous border closures in Macedonia, Serbia, Croatia, Slovenia and Hungary, the „revolving door system in Greece“ would „come to a standstill“. The „organised onward travel“ of migrants along the Balkan Route would be interrupted, the situational analysis states. According to the evaluation of the security agencies, „preventing all crossings of the terrestrial borders“ is only realistic „with substantial human resources and technical efforts“. Otherwise the „green border“ would turn into a „gateway“. In the case of systematic and sustained border closures along the Balkan route, the agencies expect further „congestion“ and a „further deterioration of the humanitarian situation“. The situational analysis depicts several scenarios. Routes could shift to Bulgaria, or refugees could travel via Albania and to Italy by boat. Greece would have to take on a more prominent role and conduct returns to Turkey. In the case of accumulations in Turkey, refugees could restart trying to reach Italy by cargo boat („Ghostships“). The analysis expects a further increase of the refugee flow. „Migration on the maritime route from Turkey to Greece has risen again in October“, Gasim ascertained last week. The analysis refers to „an increase in the number of Syrian nationals coming from Lebanon and Jordan“. 50% of Syrians in Jordan intend to “ leave in the near future“. 91% of them aim to reach Europe, according to the analysis. 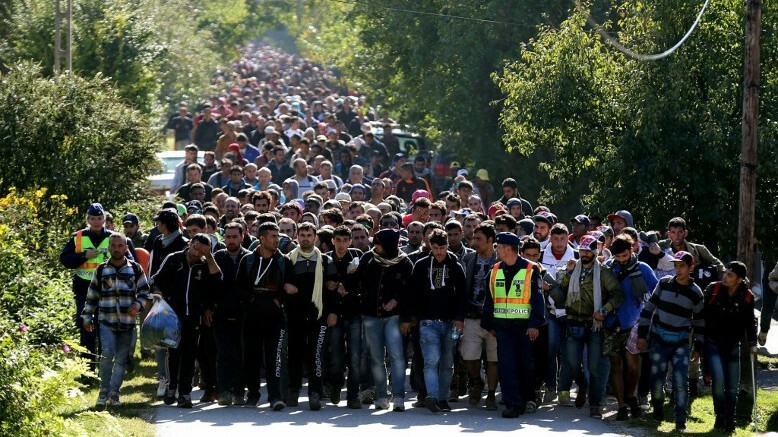 http://ffm-online.org/2015/10/19/thousands-of-refugees-rush-into-croatia-after-days-in-no-mans-land/ Concerning the situation in Presevo during these days, cf chapter 2.